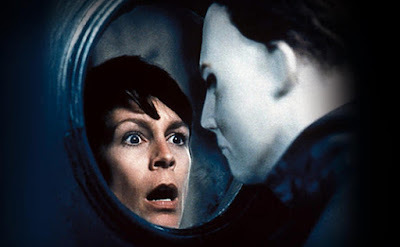 I did not like Halloween H20: Twenty Years Later when I first saw it, after the pretty good series before this felt like a bump up into main stream territory, to be honest I'm still pretty lukewarm on it. Also I have only just noticed what a long ridiculous title it has. H20 is a direct sequel to Halloween II and completely wipes the time line of Halloween 4: The Return of Michael Myers, Halloween 5: The Revenge of Michael Myers, and Halloween: The Curse of Michael Myers, as far as this is concerned those three didn't even happen. So it has been twenty years since Laurie Strode (Jaime Lee Curtis) had a night of terror when her brother came for her and she is now the headmistress of a private school. She still lives in fear of Myers whose body was never found and so gets extra jumpy every Halloween, it seems she has good reason to be nervous as this time he does come back, but with her son in danger Laurie decides this time she is going to confront her demons and fight back. First off I do not like that the events of Return, Revenge and Curse got made non canon, I can see that the eventual Scooby-Doo style cult controlling the masked killer was a bit silly, but still it makes more sense for him to have been active all these years rather than off god knows where biding his time. The original treatment did have all previous films as canon but this was later changed, also one early suggestion was for the killer here to just be a copy cat, alas neither of those came to be. This creates an issue for me as whenever I encounter something that goes against the previous films during H20 my brain immediately starts to try and make a work around to explain the inconsistencies away which pulls me out of the film. They even indicate that Dr Loomis died of natural causes when obviously he heroically died battling Myers in Curse! (probably). Michael is also it has to be said pretty lame here. He takes a lot of damage but the mask (bizarrely two different looking ones used this time) looks a bit goofy, and the actor playing him (Chris Durand) walks around with his arms slightly raised horizontally to either side of his body making him look like a toddler who has only just learnt to walk. 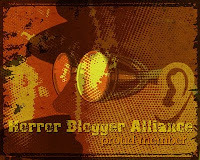 A chunk of the badness comes from Laurie's son John (Josh Hartnett in his film debut) and his teen friends who sit around playing licensed music and talking about rebellious things, seemed to be in vogue with the Scream generation, pointing out horror conventions such as when John's friend Charlie says "I'll be right back" (he never returns). At one point the friends are watching Scream 2 on TV which I do admit is a nice nod, especially seeing as in the first of that series a group of friends sat around watching Halloween. Another fun nod, this time at the Friday 13th films is right at the start when a very youthful Joseph Gordon-Levitt bursts onto camera wearing a hockey mask. Another bad decision was to feature a token comedy black guy (LL Cool J) who you just know is going to avoid any horror at all due to being full of wise cracks and silly lines. Going in line with the earlier films there is not much blood at all, people get stabbed and sliced, Michael himself is impaled with several sharp objects but there is not much spillage. Other references to the originals include a few flashbacks using clips from Halloween, while there is also a famous Loomis quote re-read, When Laurie (being hunted at the time) opens a door to find a wardrobe it was pretty funny to have her say "f*ck that!" and close it again; a direct nod to the first film. Dire mention has to go to the strangely bombastic main score that at times teases the iconic John Carpenter theme but more often than not free styles into generic dramatic 90's horror music. One thing this really gets right is Laurie Strode's fragile mental state, no idea how she came to be a head mistress but aside from that she is shown to be an alcoholic with P.T.S.D who has frequent nightmares and constantly hallucinations about her brother, it makes the scene she finally sees him again all the more effective. The sequence where she walks through the grounds of the school at night, axe in hand screaming for Michael to come face her are to be fair pretty awesome and has some connotations with the classic Frankenstein story. It is all ruined by the very silly final five minutes. 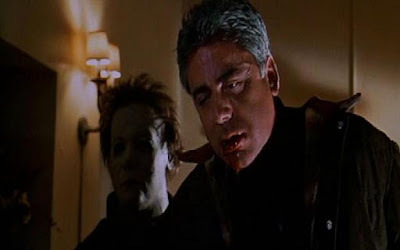 A series of misadventures with Myers is already pretty dumb, yet when you throw in the retconned ending to explain certain impossible events in the sequel Halloween: Resurrection it gets all the more ridiculous. I like some of what they did here, Curtis doesn't do a bad turn but the rest of the characters feel very one dimensional, there for looks rather than acting ability. Meanwhile Michael just does not intimidate, spending half the film playing peek a boo with people and the other half being more ineffectual than usual. If you cut Halloween H20: Twenty Years Later in half you would no doubt find 'Average' printed on the stump.